While sewing I generate lots of trimmed edges, cut threads and general fluff and I need a handy receptacle to keep them off the floor. I have a cloth bag that sits under my serger to catch the edges but otherwise I've been using a basket lined with a plastic bag. 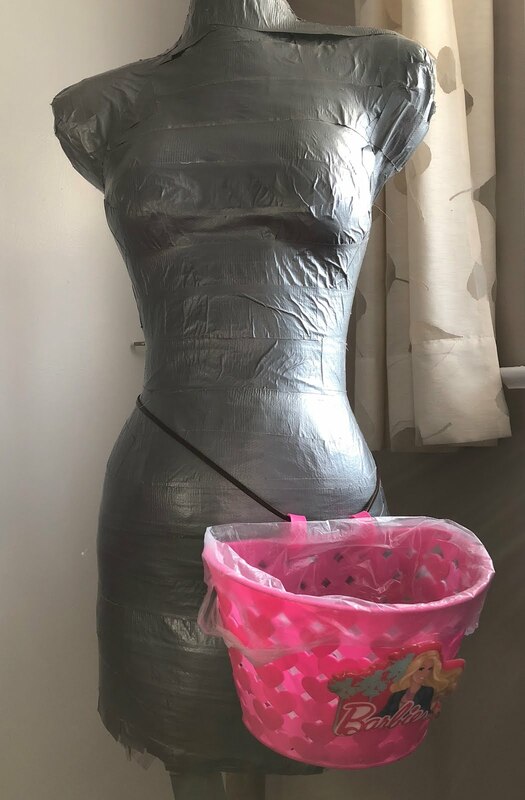 It sits on the floor and tends to retreat deep under my sewing table where it is inaccessible and this has been bugging me. Also, it's stationary and I move around, clipping threads and trimming seams here and there. I saw this item at Lee Valley tools. It's a plastic bucket that slips into a neoprene sleeve which fastens to a belt with clips of some kind. 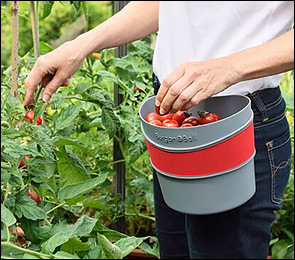 It's supposed to be used in the garden. But I balked at the price ($31.50). I threaded a thin belt through the plastic strips that are supposed to attach it to handlebars. It also came with streamers, but I can't quite figure out how to attach them. 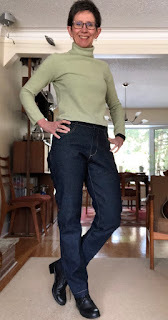 Another pair of the Morgan jeans pattern has tumbled off my sewing table. These ones are blue denim, with very little stretch. The fabric is considerably beefier than my last pair. 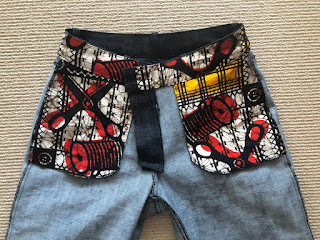 Otherwise, they are identical, right down to the crazy print I used on the pockets and waistband facing. Staving off the questions, I bought this fabric many years ago from an on-line shop called Wazoodle, which was originally in Canada. There is still a site with this name that may be the successor but it is now in the US and I'm not sure if it is the same business. The denim was marketed as originating with Levis and I bought a lot of it. There is only enough left for a pair of kids jeans. I'll sock it away just in case. I used classic yellow jeans topstitching thread, so the traditional jeans details show up. 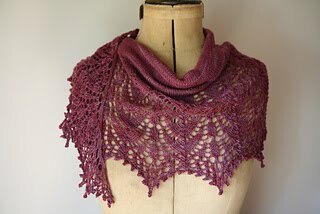 Knitted lace and vote on my next project! This lace is kind of flat. The stitches move around but in two dimensions. Click on the photo to the right and you will see them in greater detail. There actually is a 3 stitch cable in three rows (two of them are in a line just above the points) but at least in this yarn, they don't really stand out. The yarn is a mix - 49% wool, 34% mohair, 11% nylon (technically it's a sock yarn), 4% acrylic and 2% silk. 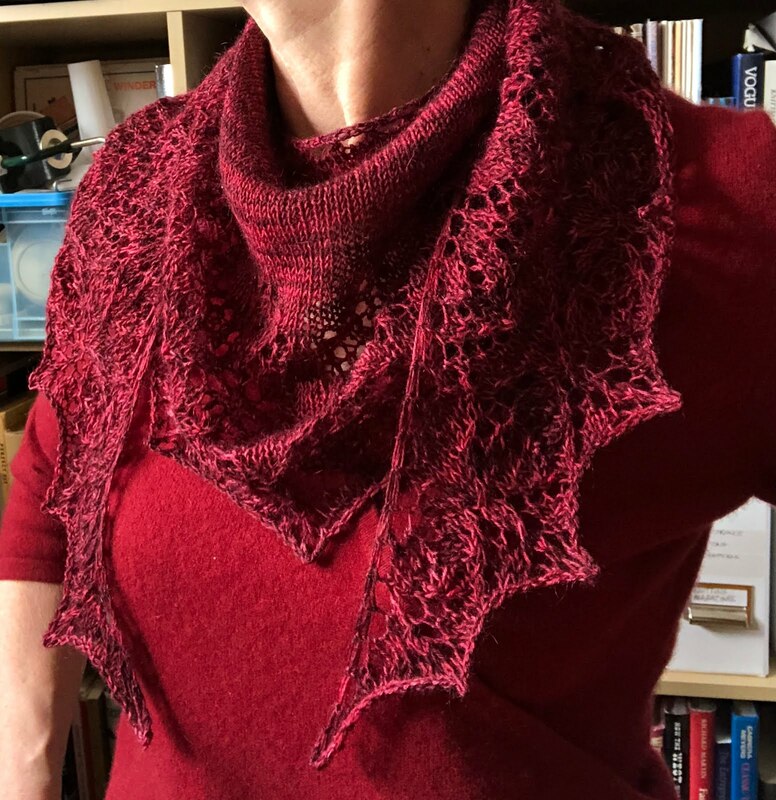 The mohair means the shawl is very light, decidedly non-drapey and a little hairy, and maybe it wasn't the best choice for this pattern. But I do like the finished project. 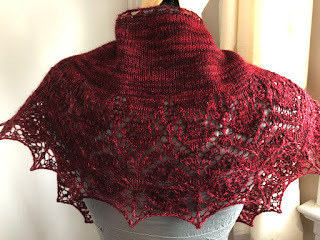 The pattern was fun to knit because it consisted (once the plain base was done) of 23 completely different lace rows with plain purl rows between them. 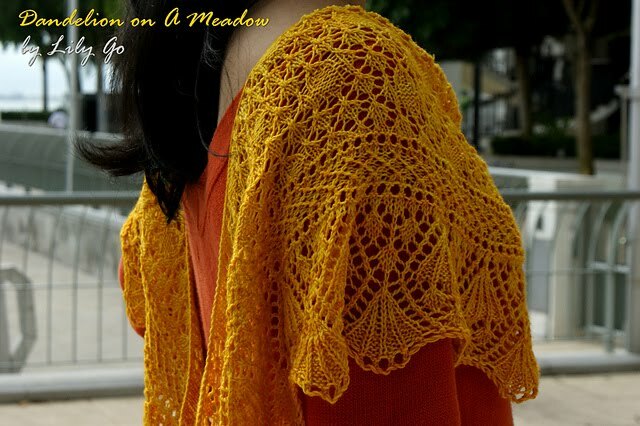 Now I'm looking at other lace shawl patterns. Which of these do you like the best? Tell me why in a comment! Pro - gorgeous texture, and it's free! No beads (nupps are so much nicer!). Con - triangular, not my favourite shape. 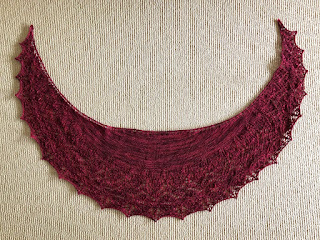 A Raveller has figured out how to make it into a sort-of crescent but her version used 800m of yarn. The pattern itself calls for 440-880m, which would require an annoyingly small amount more than 1 skein of sock yarn (100g). On the other hand I have some lace-weight in the right amount. Pro - wonderfully spiky, already a crescent, many variations are possible, including designer-sanctioned choice to omit all beads. Could be made out of 100g of sock yarn. Con - a relatively expensive paid pattern since I have to buy an entire e-book to get it. Pro - crisp lace, combination of textures, crescent shape. 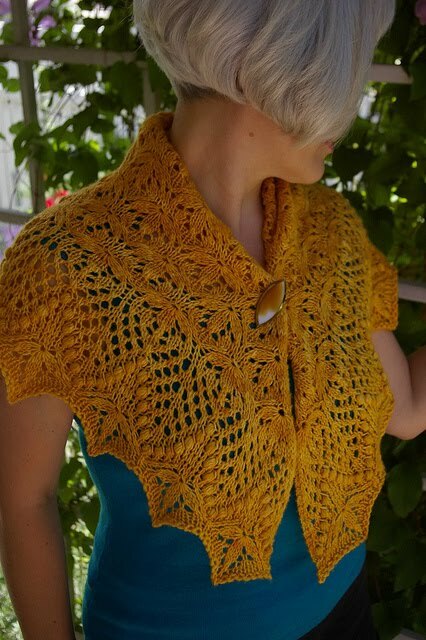 It can be made with 100g of sock weight yarn (350-400m). Con - (maybe, maybe not) this is knitted from the bottom up rather than top down. I haven't made one this way before. Paid pattern. Pro - another spiky lace pattern from the same designer as Sweet Dreams. It's less expensive since it's available as a single pattern. It could be made from 100g of sock yarn. Con - A paid pattern. 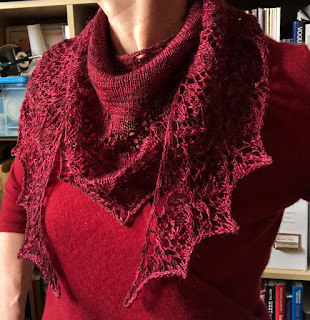 Although you can't really tell from the photo, the lace pattern doesn't vary much as the shawl progresses, so might be less captivating to knit. And is it too baroque for The Sewing Lawyer? Excuse me while I go diving in my yarn stash. I do love machine knitting. So fast. So satisfying (when it goes according to plan). As it did for this project in the last couple of days. 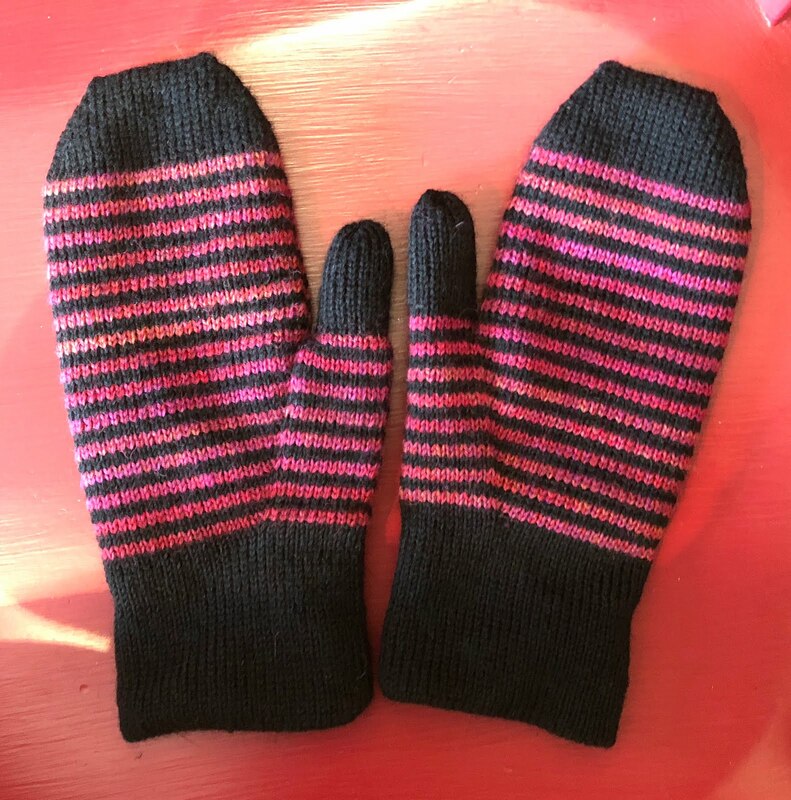 I used a pattern that is free on Ravelry - Fully Fashioned Machine Knit Mittens. My quick assessment is that this is a pretty good pattern, but if (when) I make these again I will do it circularly. It was a royal pain to have to seam these - up the thumb and side of the mitten hand, then from the wrist edge to the lower edge of the thumb. And grafting the finger end. And it had to be done twice because these mittens are lined with an exact copy of themselves! You knit the outer layer and then rehang the wrist edge and knit the lining down. And there were about a million ends from both the inner and outer layers and the waste yarn and it was confusing ... and very black. Very bad for night-time sewing. But they came together really well. 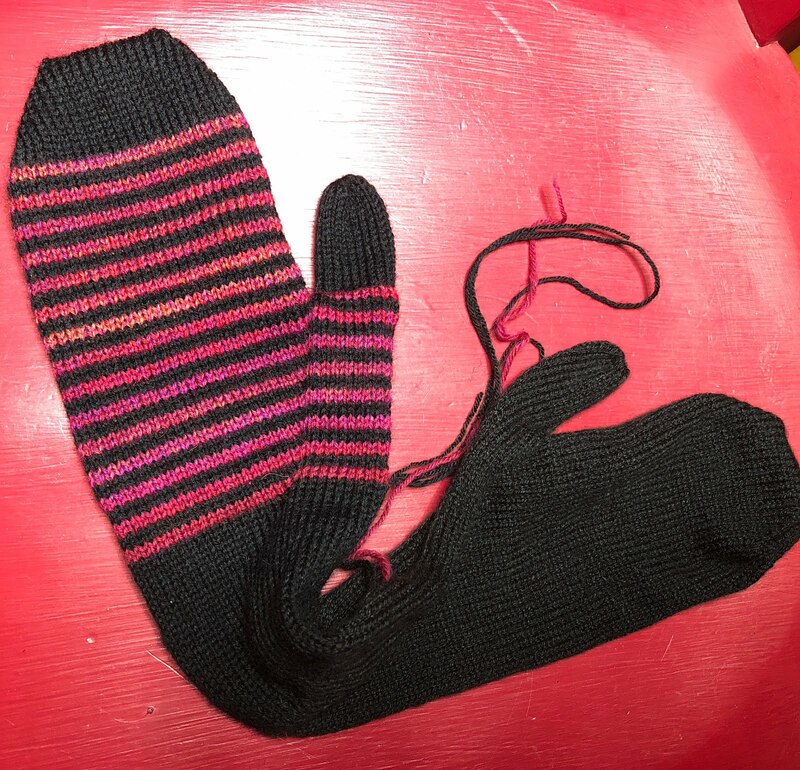 I used black sock yarn (only 35g) for the outer mitten and a tiny bit of the pink/red which in turn was leftover from my very first socks. The lining is Woolike, a 100% acrylic yarn from Michaels. It's nice and soft. 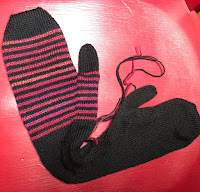 The finished mittens are thick and feel substantial. They would not block wind but will be good for some conditions, including when I'm skiing and my hands are really warm from my serious mittens but it's too cold to simply remove all hand covering. My poor neglected blog is about to get its annual boost as I'm off work starting today for five whole weeks! Time to sew, time to knit, time to blog. I call it practising for retirement. 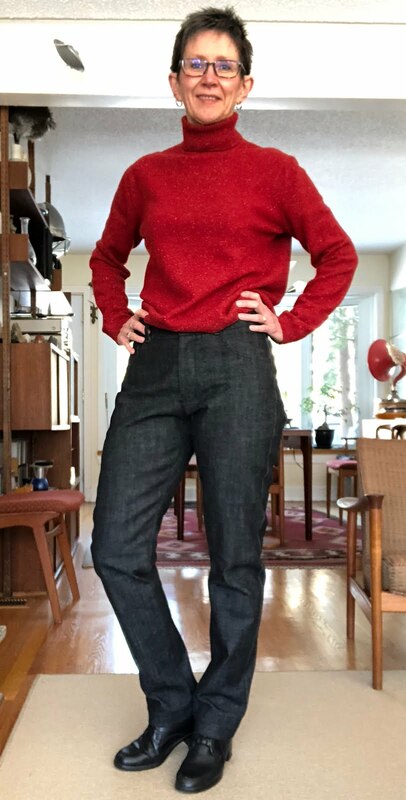 I've started my staycation with a pair of Morgan jeans from Closet Case Patterns. This is my first time sewing a CC pattern. I'm going to do a proper review over on PatternReview but the short form is - I'm impressed. I will definitely make these again, and soon. 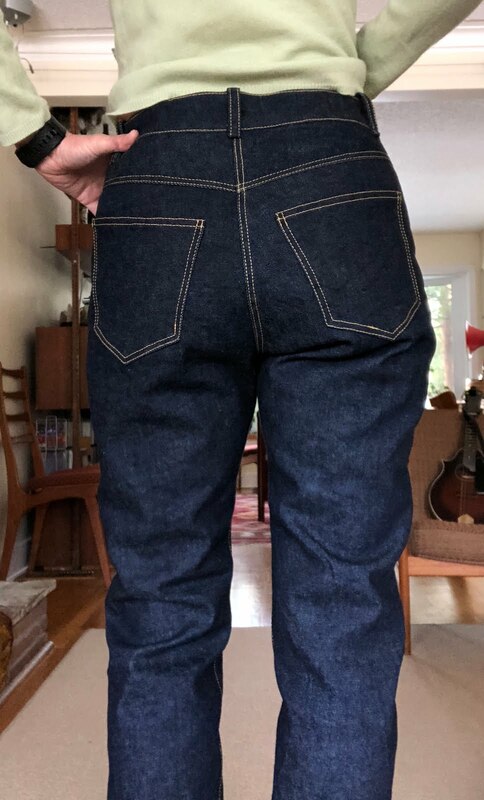 I've been cycling through the same two pairs of blue jeans since practically forever (August, 2010) and they are almost done. It was interesting to read that post from 2010. 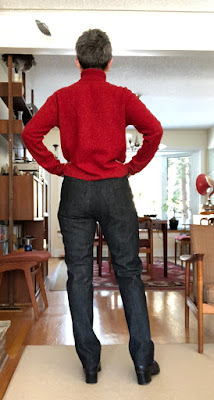 I still have that Levis denim from Wazoodle in stash, and I still do not like skin tight jeans. So rather than struggle with the Jalie stretch jeans pattern again with a different low-stretch denim from stash, I turned to the Morgan pattern. Boyfriend jeans. If you believe Google, the term is used to denote jeans that have all the classic bits but with a "relaxed fit", usually straight legged, and frequently torn and/or distressed. It was mostly relaxed fit I was after. First, the jeans are designed to have very little ease through the hip. I traced size 8 at the waist and 10 through the hip and leg, based on actual measurements. 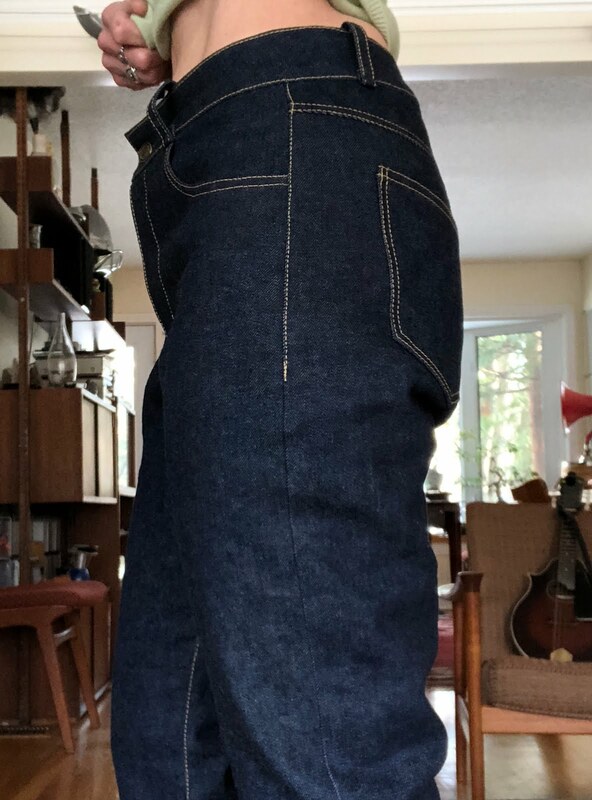 I got the jeans done through to the side seams which I based at 1.6cm (5/8") and tried on. Too tight for my taste. 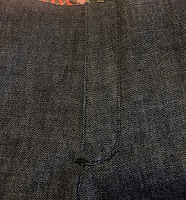 I re-sewed, tapering from the original size at the waist to a 1cm (3/8") seam, which gave me a nice extra 2.4cm (1") at the hip. 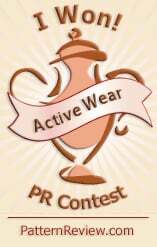 Fit is now just right, by my non-fashionista standard. These are made out of black denim which is slightly stretchy. The pattern is supposedly for non-stretch but I'd want even more ease in that case. 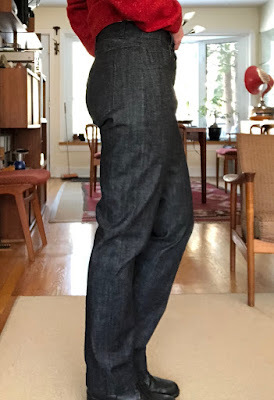 I like the rise on these as designed, although I sewed a slightly smaller seam allowance attaching the curved waistband to the pants body, and turned under less at the top of the waistband. As a result it's just over 4cm (1.75") wide, a bit wider than designed. I had to take a tiny dart at CB to keep it from sticking out and I'm modifying the waistband piece to be more curved for my next pair. And while I am on the subject, no one is allowed to look at the buttonhole either. My fancy machine (Pfaff) struggled mightily and after picking out as much as I could of the terrible tangle of thread that resulted, I sewed over the remains with my trusty buttonholer using my Featherweight. The Featherweight also handled all topstitching tasks using a heavy upholstery thread. What a great machine! The Pfaff was otherwise completely brilliant. 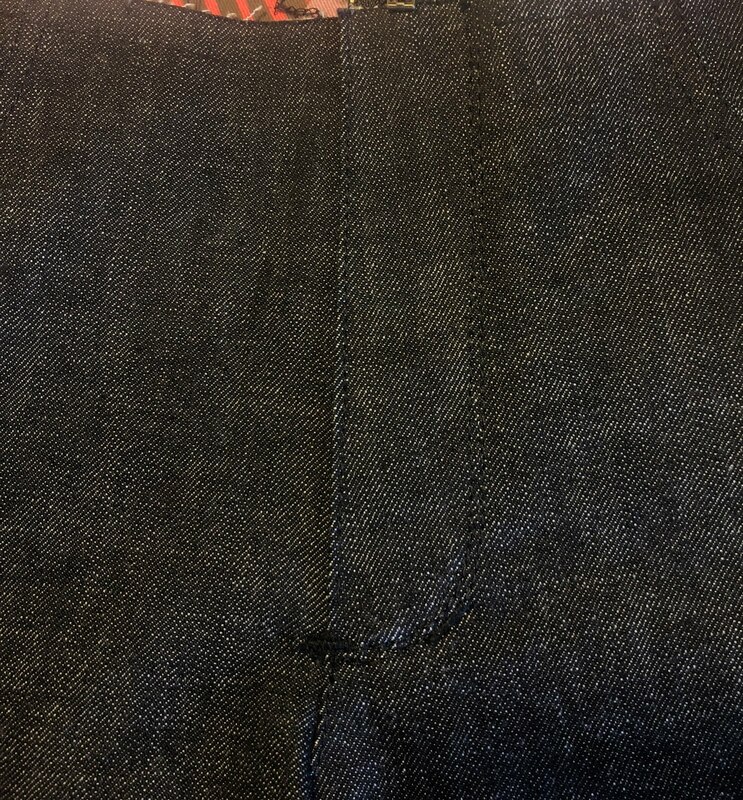 I used a Jeans needle and it chunked nicely through all construction points, including bar tacks to attach the belt loops (that would be at least 7 layers of denim). While the outside of these is indeed sombre, the insides are not. 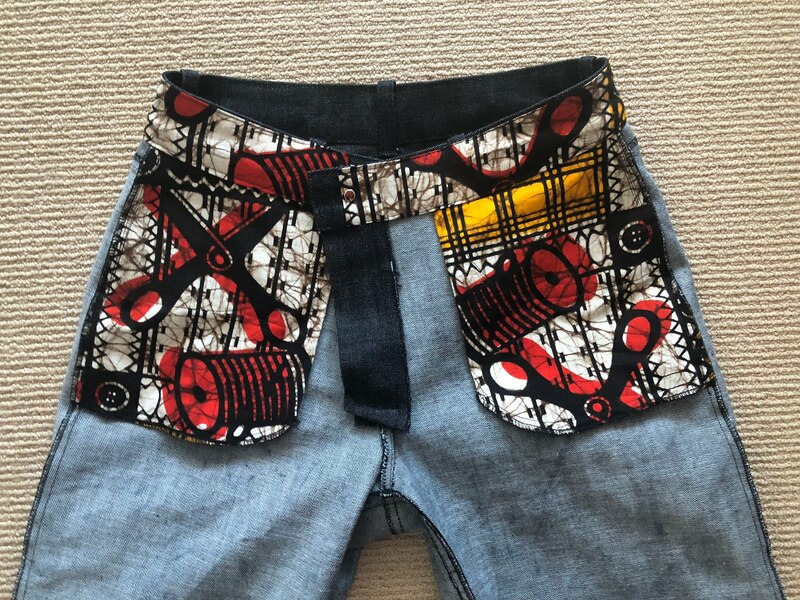 I used a fun cotton print of African origin with a sewing theme to do the pockets and face the waistband.